"Requiem for Methuselah" was first broadcast on February 14, 1969. 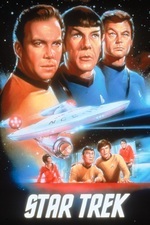 Its repeat broadcast, on September 2, 1969, was the last official telecast of the series to air on NBC (Star Trek would immediately debut in syndication on the following Monday, September 8, a full three years after its debut). It is episode No. 74, production No. 76, written by Jerome Bixby and directed by Murray Golden. It guest-stars James Daly as "Mr. Flint", and Louise Sorel as "Rayna Kapec" ("Kapec" is an anagram of Capek, after Karel Čapek, who introduced the term robot). In this episode, the crew of the Enterprise encounters an immortal human in this science fiction variation on Shakespeare's The Tempest. The writing for the original Trek was stagy and writer-ly in such an awesome way. It had that in common with The Twilight Zone. Both shows featured some truly poetic lines, in a way a modern show just wouldn't. "It is thirst. It is a flower dying in the desert." "I have married a hundred times, captain. Selected, loved, cherished. Caressed a smoothness, inhaled a brief fragrance. Then age, death, the taste of dust." "I know death better than any man. I have tossed enemies into his grasp. And I know mercy. Your crew is not dead, but suspended." The writing for the original Trek was stagy and writer-ly in such an awesome way. It had that in common with The Twilight Zone. Honestly, that is just 1960s television. I watched a lot more teevy in the 1960s and early 70s than recently, and I'd say that probably any dramatic series from the era would strike a contemporary viewer that way. I think it's just how they did things then, a more 'operatic' style. For reasons not worth going into, I recently looked up a scene from Marcus Welby, M.D. -- Pete Deuel standing on a ledge, Robert Young trying to talk him down -- it'd give you that same writerly, operatic impression. The actors essentially deliver speeches at each other. Hell, watch an episode of Mod Squad or even Bonanza. Much the same, especially when the writers felt that they had Something to Say™. The quest for gritty realism didn't really take hold in television until I'd say 1973 or 4-ish. I don't have a theory to account for this, just an observation. I've watched a lot of older TV and I know what you mean. Maybe it would be more accurate for me to say that Trek and Twilight Zone just did it BETTER than other shows of the era. For some reason the one immortal(ish) person being responsible for many of humanities great artistic masterpieces (or any other major historical developments in political and social realms) has always rubbed me the wrong way and I can't get past my distaste of that. The dialogue cited is great though and thankfully wasn't credited to Flint. Maybe it would be more accurate for me to say that Trek and Twilight Zone just did it BETTER than other shows of the era. Those two shows'd be high on my short list, too. Apart from a huge swack of undefined AI and robotics development necessary to make Rayna possible, that's the big plot hole here; that Flint'd need to hide in plain site and change identities repeatedly, but in those identities he chose to be some of the biggest show-offs in history. Pollack is an interesting case. 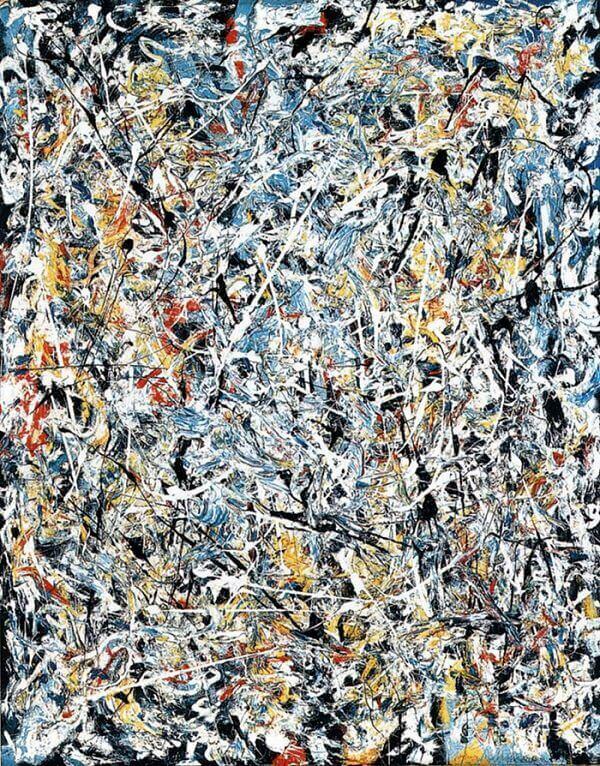 Reginald Pollack (1924 - 2001) -- not to be confused with Jackson Pollock (1912 - 1956) -- was a real world painter all right, and the only historical figure mentioned in this episode who was actually alive at the time it was broadcast. A US WWII veteran, Reginald Pollack studied with Brâncuși in Paris after the war. ". . . a fine artist, humanist, poetically inclined anti-Vietnam war peace marcher, participant, with other artists, in an antiwar coalition, occasional user of pot and sympathizer with hippies and yippies and most youthful rebels." About the time his name was invoked in "Requiem for Methuselah", Pollack produced the painting Peace March that "captures the Dionysian tone of 1967's Summer of Love . . . [to illustrate] the anti-Vietnam War sentiment [of] the late 1960s." The episode dialog doesn't actually state that Reginald Pollack is one of Flint's aliases, only that Spock spotted his paintings hanging on Flint's walls. Pollack's work can currently be found hanging on walls in the Metropolitan Museum of Art, at Stanford University, and the New Orleans Museum of Art. * Any list of three nouns that include two things from Earth or Earth history, and one fictional thing from the future (at the time of writing) or from another world. Star Trek does this constantly. It may even be the Trope Namer -- or Codifier. There are times when Trek goes for stuff that's a little too big, things that "explain" aspects of our world in sci-fi terms that are hard to buy. This is arguably one of those. Leonardo da Vinci is a popular target for this kind of treatment in SF. There's always somebody going back in time and becoming Leonardo. Note especially, the fate of 20th century time traveller "Leonard Vincent" in Heinlein's Door Into Summer. Of course, while time travel plots help explain where Leonardo 'got his futuristic ideas', they seldom explain how he learned to speak Mediaeval Italian, or how he explained his sudden appearance as an adult to, for example, Piero and Caterina da Vinci. So "Requiem" is an outlier here. That's a fascinating bit of info about Reginald Pollock. While he seems like he was quite accomplished in life, I studied art history for years and I don't think I'd ever heard of him! I wonder if Jerome Bixby (the screenwriter for this episode) or somebody else connected to Trek knew him. I suppose it's also possible his name was in the newspaper and Bixby included him on a whim, but he does seem like a strange artist to toss into Flint's collection. Why not make it a Warhol or a Picasso or a JACKSON Pollock, somebody viewers of the time would be more likely to recognize? If he was just randomly used, I like to picture him watching at home and being stunned to hear his name in that context! I wonder if Jerome Bixby . . . or somebody else connected to Trek knew him. I suppose it's also possible his name was in the newspaper and Bixby included him on a whim . . . I like to picture him watching at home and being stunned to hear his name in that context! Pollack was living and working in the Los Angeles area when Star Trek was in production, and of course, so was Bixby, an established television writer and an Angelino by birth. Entirely possible that they could have been in the same social circles; or Bixby may have simply been familiar with his work; or it may have been as casual-- as whimsical -- as your news headline. I haven't been able to establish a connection, but I lean toward a deliberate homage because they normally tried to avoid such collisions with reality. Star Trek production notes show them changing characters and place names provided by original scriptwriters, after referral to the Research Department. So, if the script called for a psychologist named Amanda Smith, but Research tells them they found a psychologist named Amanda L. Smythe who hangs her shingle in Medusa Springs, Nebraska, they might change the character's name to Miranda Jones. Why not make it a Warhol or a Picasso or a JACKSON Pollock, somebody viewers of the time would be more likely to recognize? I'm not so sure that I would've known who Warhol or Pollock were in 1969, and Picasso would have been little more than a name. There was a mural of Picasso's Guernica on the wall of one classroom in my high school, so I'd've been familiar with that and just a few other really well known works. Like Pollack, Picasso was living at the time "Requiem" was broadcast -- for example, his public sculpture in Chicago's Daley Plaza was unveiled during Star Trek's production. And Picasso/Flint would have been more to scale with Leonardo/Flint than Pollack/Flint. Picasso also lived a long and productive life, so you can imagine a Flint anecdote where there was some very good reason to hang onto the Picasso identity for 90+ years. A missed opportunity -- or a fanfic opportunity for someone with an art history background? I nearly forgot to mention -- This episode sets the record for references to wealth on Star Trek. The Feds come to a planet that was purchased by a wealthy financier to mine for yet another exotic mineral that they can't just replicate on board the ship. See also, (di)lithium, topaline, tritanium, zenite, and salt. I'm not so sure that I would've known who Warhol or Pollock were in 1969, and Picasso would have been little more than a name. That's surprising. I wasn't around in the 1960s, but I was under the impression Warhol was a big deal then. He was parodied and interviewed on TV and mentioned in songs and stuff. (He's referenced in a Monkees lyric!) Do you feel like the other kids in your school wouldn't have known about him either? I thought everybody knew his soup cans and stuff. He was definitely pretty widely known by the seventies, when he was on The Love Boat and so on. I know his shooting in the 1960s was a big new story, I've seen the headlines from the era. I'll have to ask my parents if they knew about him at the time. U.H., it was a looooooooooooooong time ago. Before I knew or cared anything about art, or had opinions of my own, I'd heard about the Campbells Soup and Marilyn prints -- probably via MAD Magazine. At some point I'd heard of (not seen) the films Sleep and Empire -- presented as 'ridiculous'. I couldn't say when that was in either case; I doubt by 1969. I certainly wouldn't have had a coherent image of Warhol either as a person or as an artist in 1969. I don't think I could've pulled him out of a police line-up. I didn't know that he'd been shot until the 1980s. I wasn't around in the 1960s, but I was under the impression Warhol was a big deal then. He was parodied and interviewed on TV and mentioned in songs and stuff. Except for the Monkees, I think you're mostly thinking of the 1970s. He might've been on What's My Line? or something. The Bowie song came out in the early 1970s. In any case, you're also looking back synoptically, starting out with a pre-existing opinion about him. To a young person living in those times with a zillion other interesting things going on, all the little clues just don't add up to "famous person that everyone knows about". To be honest, for a young person, Peter Max would have been nearer the mark than Warhol. Americans in general in 1969 at least knew the name Picasso, even if they couldn't've identified a painting as his. Star Trek was aimed at a general audience. And so the mystery of Reginald Pollack remains. I'll have to ask my parents . . . Sorry, I wasn't trying to do the whole "I'm going to passive-aggressively try to make you feel old" thing. I'm not so young myself! This episode was one of my favorites. I have always been fascinated by the theme of immortality and what does one do with all that time and its limitless horizon. In the case of Flint, I thought Rayna, was not interesting enough for a character like Flint and her ease of having Kirk fall in love with her was hard for me to imagine or suspend my disbelief. One of the issues I have had with immortals, including bloodsucking fiends from hell are what do they do? Those vampires with their sense and access to time? Nothing created, nothing lasting except a character pursuing not fully developed young somethings, maybe a love triangle. I love the lines from earlier TV with its expectations of long sentences, sentiment, and prose like phrasing. So Flint's line about loneliness and immortality provided the poignancy and the motivation for his bizarre setting of a love triangle.